Esperanza — the latest large-scale, master-planned community coming to a northern San Antonio suburb — seems aptly named. Translated as “hope,” business, government and economic development leaders in Boerne are hoping for different things from it. Bill Hinckley, president of The Lookout Group, the developer of Esperanza, is hoping his company’s considerable investment and risk will pay off the way his even larger master-planned community north of Austin has. At 1,240 acres, Esperanza is set to bring 2,480 homes to Boerne. It would be the largest such development in Kendall County, according to Hinckley. Esperanza was approved by Boerne in 2007, but it stalled due to the recession. Houston-based The Lookout Group picked up the project in 2013 and received final approval from the city in May of last year. Dan Rogers, president and CEO of the Kendall County Economic Development Corp., meanwhile, is hopeful that this master-planned community will help Boerne create a more self-sufficient economy and attract startups and medical-related industries such as health care and medical device manufacturing. Yet growth presents a number of challenges for cities, from water supply and transportation issues to how a school district grows without the upfront funding that new students bring. There’s also existential questions that arise, such as how to keep a small town’s identity intact. Master-planned communities can offer advantages to small towns like Boerne, though, when compared to subdivisions that can fail to address the needs of a growing community because individual subidivisions often don’t plan for their cumulative impact, Rogers said. Esperanza, for example, will bring two new schools, city-owned parks, $2.3 million toward road improvements and the transfer of significant water rights to Boerne — as well as space allocated for commercial and retail development. And to ease residents’ anxieties, Hinckley made a point to incorporate Boerne’s existing look and feel into Esperanza. Despite the benefits of a master-planned community, Hinckley also noted that there are few of what he considers “true master-planned communities” in Kendall County — he said Esperanza will be the first in Boerne — because they’re costly to build. Some bedroom communities are growing so much, they are essentially building their second bedroom. Others are steering toward a different path, one of economic viability with industry of its own. Boerne is just one of the towns in the San Antonio area pondering its direction. Much like cities up the I-35 corridor, Kendall County is now considering what it wants to become, as land inventory dwindles around Loop 1604 and development marches further north up I-10. The Kendall County EDC was created in response to this development in 2006 after key community leaders saw the 2000 boom and wanted to better manage growth. Rogers’ office is in Boerne, where he studies Kendall County’s demographics. There are several key statistics he noted that make Kendall County and Boerne economically viable. The county’s average age continues to decrease as young families move to Kendall County because of its school districts, in contrast to most Hill Country towns that see an increase in retirees. And those living in Kendall County are educated. Almost 40 percent of adults in Kendall County hold bachelor’s degrees, the fifth-highest percentage in the state, according to research by Indiana University. All those factors bode well for businesses and the potential for Esperanza to foster economic independence rather than increasing bedroom community status. Currently, of the county’s 18,000-person workforce, 58 percent leave the county and head south toward San Antonio for employment. If Boerne could keep just some of those workers in town, it would mean more dollars spent at home, more business taxes for the city and county, and less pressure on highways and roads. 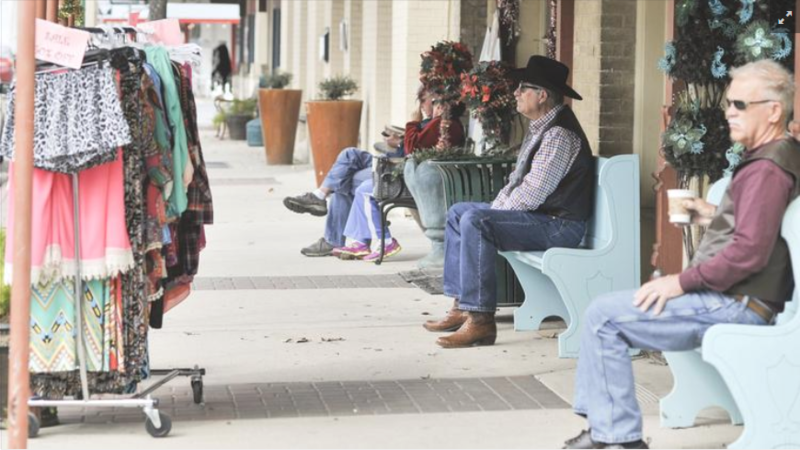 Boerne’s population sits at about 12,400 people. Though Esperanza is the largest development in terms of homes proposed for Boerne, it isn’t the only one. Another four subdivisions are also in early development phases. Regional experts predict that by the time all these projects are built out, Boerne will add another 5,000 homes and 12,000 residents. “When you put it all together, there’s a whole other Boerne in state of development right now,” said Jeff Thompson, Boerne’s deputy city manager and director of economic development. Hinckley wasted no time in getting Esperanza going. Yantis Co., a San Antonio-based land developer, has already cleared parts of the property to make way for rudimentary dirt roads, utility lines, and sewer and water pipes. What will rise out of the thicket will eventually include a fire station, a 23-acre city park, a recreation center, 35 acres of commercial property, 340 acres of open space and a 15-mile hiking trail. Master-planned communities usually fare better than the typical subdivision, Hinckley said, even in tough economic times. Consider his even larger development, the 5,000-acre master-planned community called Crystal Falls in Leander, a town just north of Austin. That development has consistently topped the nation’s 50 best-selling communities list. While master-planned communities are abundant in states such as California and Florida, as well as some Texas cities including Houston and Dallas, their profile is just rising in San Antonio, Hinckley said. Rogers is OK with master-planned communities coming into Kendall County, because master-planned communities such as Esperanza provide a mechanism to get ahead of problems.